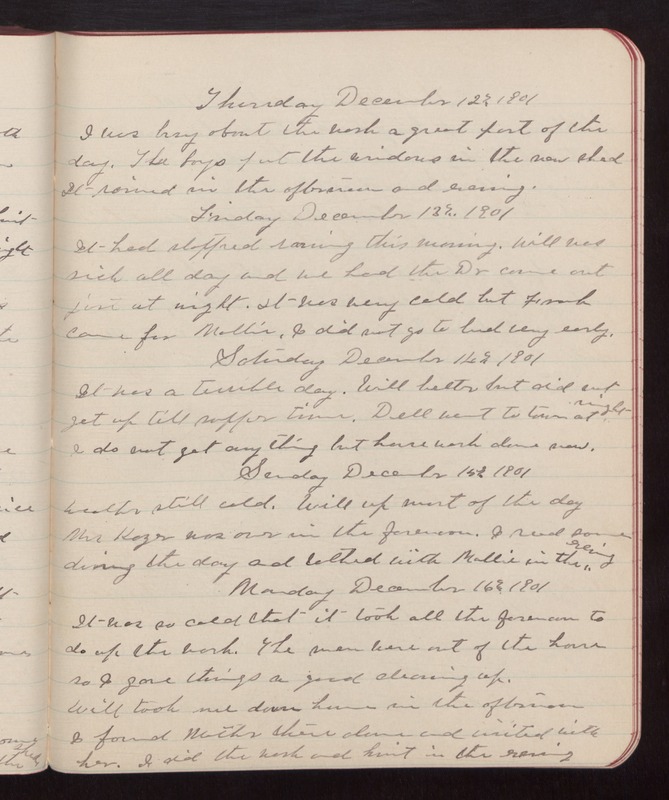 Thursday December 12th 1901 I was busy about the work a great part of the day. The boys put the windows in the new shed. It rained in the afternoon and evening. Friday December 13th 1901 It had stopped raining this morning. Will was sick all day and we had the Dr come out jist at night. It was very cold but Frank came for Mollie. I did not got to bed very early. Saturday December 14th 1901 It was a terrible day. Will better but did not get up till supper time. Dell went to town at night. I do not get any thing but house work done now. Sunday December 15th 1901 weather still cold. Will up most of the day. Mr Kazer was over in the forenoon. I read some during the day and talked with Mollie in the evening. Monday December 16th 1901 It was so cold that it took all the forenoon to do up the work. The men were out of the house so I gave things a good cleaning up. Will took me down home in the afternoon. I found Mother there done and visited with her. I did the wold and knit in the e4e4vening.